THHHWUMP! It took a moment for my brain to register the sound of my camera hitting the ground. It looked rather cozy, laying there, covered in about 6 inches of soft snow. ‘Sh*t,’ I softly uttered as I picked it up, graciously accepting the kleenex my friend Jamie produced. I wasn’t overly worried about my camera surviving the fall, mostly because I trust the hardiness of my equipment. But I was also feeling rather slow-witted and numb as a result of slogging through the snow for the past hour, looking for ptarmigan. The snow was falling lightly but persistently – the mild temperature allowing for large, wet flakes that easily seeped through the lining of my light jacket. I was getting wet and cold, and my patience with the wet stuff was wearing thin. A familiar feeling washed over my body – winter has not even officially come yet and I was already beginning to hate snow! You’d think Mother Nature would take that opportunity to present me with a long-sought-after wildlife sighting, given what I’d been through already. But no, she knew I had to reconcile with the snow, to realize that nature always presents opportunities to reveal in its beauty, no matter what the weather. About two hours later, I was absolutely, head-over-heels in love with the snow! 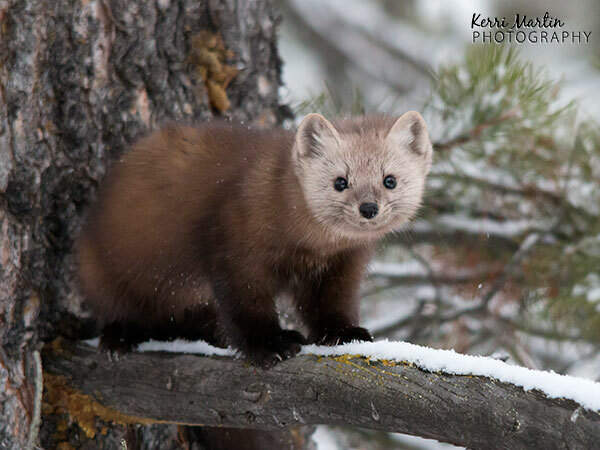 The soft, cottony substance encased the small feet of a pine marten, preserving a trail that led Jamie and I to a mind-bogglingly exciting 15-minute photo session with this beautiful creature. ‘I’m pretty sure it’s a squirrel but can you back up a bit?’, I asked Jamie on our drive home, wanting to investigate the figure I saw on the side of the road. No sooner did I roll down the window did I see the long-bodied, dark figure through the trees – this was no squirrel! ‘Marten! It’s a marten!! !” Jamie hopped out of the jeep and we scanned the trees. 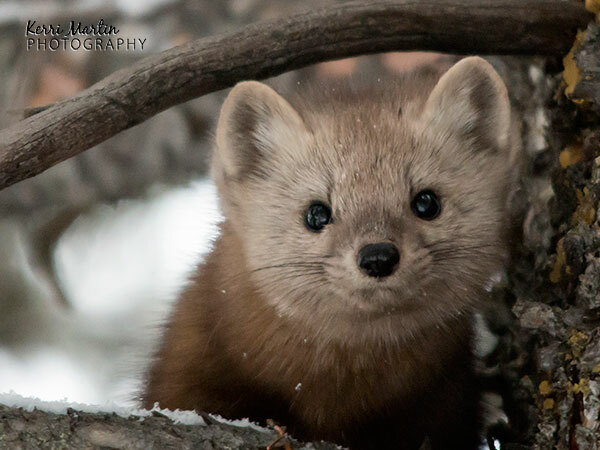 The marten jumped out from behind some fallen trees and ran off into the forest. Jamie and I both captured a couple of distant, blurry photos but were not satisfied with a quick glimpse. We examined the tracks on the side of the road and decided to follow them. The marten tracks zig-zagged back and forth through the trees. A few times, the tracks seemed to come to a stop at a tree – we would look up anxiously, hoping to see him starting down at us. Nothing. We’d look back down and see the tracks circle the tree and continue through the forest. 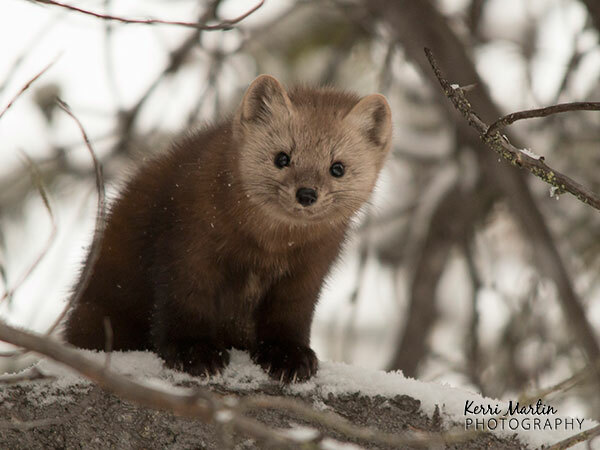 We came to a clearing where we could see the size between the front and back feet significantly increased – the marten appeared to have broken into a run. ‘There he is! Right in front of us!’ Jamie said, and sure enough he was perched on the branches of a large tree about 30 feet away. 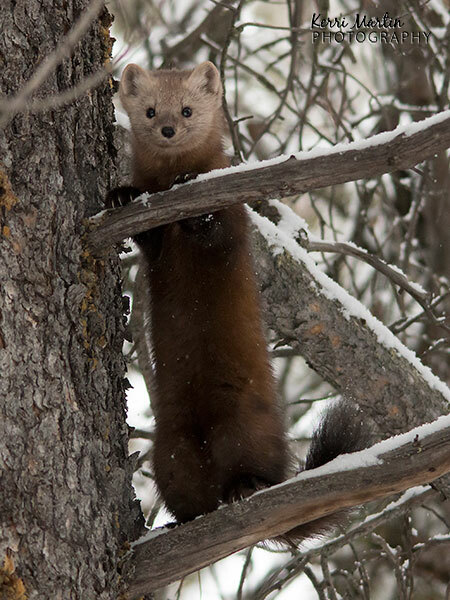 We snapped photos and watched as the marten started climbing the tree. Each time he got to a new branch, he peered down at us for a few moments before continuing upward. He seemed to be talking to us, releasing a series of soft, sharp grunts as he climbed higher. Eventually, the marten disappeared high in the tree, and Jamie suggested we back away and give him some space in case he wanted to come back down. About 5 minutes later, we started hearing the grunting again. 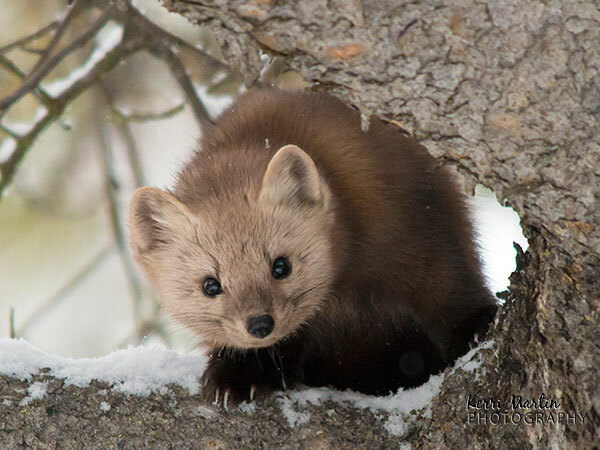 The marten was working his way down, jumping to the branch below, pausing to check us out, circling the large tree then peering out from the other side. Repeating this routine a number of times brought him down far enough to jump to the ground and run off, giving us plenty of photo opportunities. What an experience! 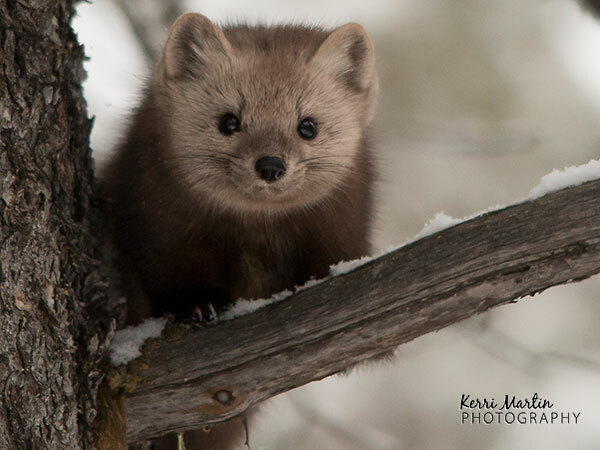 Without the snow, we never would have found the marten. Everything worked out perfectly. Thanks Reid – I’m so glad mine was alive! Congrats Kerri, what a truly great encounter! Congrats, Kerri!! Happy for you and a little jealous as I have not got a picture of one of these beauties yet. I agree on your comments on snow in your blog. I am not a fan of winter, but I get some of my most interesting photo ops in the winter. Love getting wildlife shots against a snowy backdrop. Makes for very interesting photos of wildlife versus the elements. Congrats again, and great pics by the way. Good work. Thanks Gordon! Sometimes it’s hard to love winter but it really is a beautiful time of the year with lots of opportunities!